A minimal amount of force can open doors against strong resistance, thanks to the concept of drive and control. 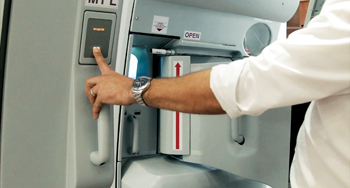 Spatial Composite Solutions has been training flight crews in cabin replicas to experience the effort they need to open a cabin door in an emergency using Rexroth drive and control technology. Spatial Composite Solutions replicates the cabin environment of all aircraft cabins employed by the rapidly growing airlines in the Middle East. “This is the only way crews can train under realistic conditions and react correctly in the case of an emergency,” Shaheed said. Spatial Composite Solutions has used electric drives and controls by Rexroth for about five years for their fire and door trainers. Doors behave differently in each aircraft type and drives need to mirror this. “For that reason, customers appreciate the easy programming of the control and the fact that we can support them locally anytime,” Shaheed says. The newly developed multi-protocol-enabled communication hardware – IndraDrive Cs – fulfills the increased demands for openness and consistency. Sercos III, Profinet IO, EtherNet/IP and EtherCat are available. These Ethernet-based interfaces are connected via a universal communication hardware, which can be configured easily using software. Alternatively, IndraDrive Cs can also be equipped with a conventional communication interface such as Profibus. 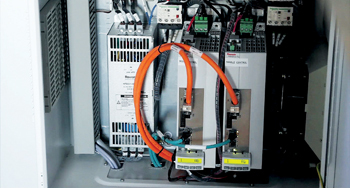 With this solution, Rexroth is offering users a high level of flexibility in communication with minimal engineering effort. In conjunction with the new multi-encoder interface for evaluating all common encoder types and an additional optional slot, very special drive tasks can also be carried out safely. IEC-compliant motion logic and industry-specific technology modules make IndraDrive Cs the perfect choice for a wide range of uses such as simulation technology.